After Francois Truffaud's 1966 version, the classic dystopian novel is up for a modern adaptation. Taking place in the near future, books are strictly forbidden. Guy Montag is one of the firemen with the task of burning the books that are left. At some point however, he starts to question what he's doing. At great conceptual sci-fi. Fahrenheit 451 is directed by Ramin Bahrani and was released on May 20th, 2018. 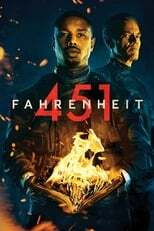 Director Ramin Bahrani's Drama & Science Fiction movie Fahrenheit 451 is produced by HBO Films & Brace Cove Productions & was released 2018-05-19.